Looking for a box store product in a bed-in-a-box form? Therapedic has dedicated themselves to providing a quality product from a longtime industry name to everyone in the most convenient way possible. That’s why the company created the Agility Hybrid, a foam, latex, and coil-filled mattress backed by one of the sleep industry’s most long-standing companies. This in-depth Agility hybrid review will look at the unique construction and qualities of this mattress. We’ll also give you scores based on Firmness, comfort, value, and more. 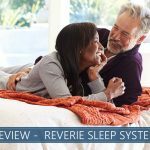 You’ll find our recommendations for sleep preferences and an overview of our final impressions of the mattress. Read the entire review for our in-depth analysis of the mattress. Or skip to the end for our wrap-up and final scores. Sleep hot – Aerated latex, coils that promote air circulation, and cooling gel infused into the memory foam should help move heat away from the body and prevent overheating. Want good motion control – Vibration dampening latex and the adaptive micro-coils should help to prevent energy from traveling through the entire mattress. This should help to minimize sleep disruption due to movement. This mattress an all-foam hybrid construction containing latex, memory foam, and micro-coils. The bed can be used with any frame, including an adjustable base. Proprietary foundations and adjustable frames can be bought through the companies website, separately or as a bundle with the mattress. The stylish cover features a plush white top with an icy blue base. Holes are stitched into the cover to help promote air flow, which could lead to a cooler sleep experience. The cover can be removed and washed in a machine, though this is not recommended as this may cause the cover to fit differently on the mattress. The height of this mattress is 11 inches. The first layer is made up of Five-Zoned Latex Foam. This material relies on different densities and amounts of latex to provide a Softer or Firmer comfort level in each zone. This mattress should offer more support in the shoulder and hip areas, and more flexibility for the head, back, and feet for added comfort. The second layer contains Bio-Based Gel Memory Foam. This layer should promote a cooler sleep experience and should act as a transition between the comfort and support layers. You should also notice the memory foam absorbs vibration to reduce motion transfer. The third layer is comprised of Mini Micro-Coils. These coils are designed to move in any direction to suit your movements and support the body as needed. This should also help to reduce motion transfer. The fourth layer is made up of Base Foam that is meant to provide support and durability to the entire bed. 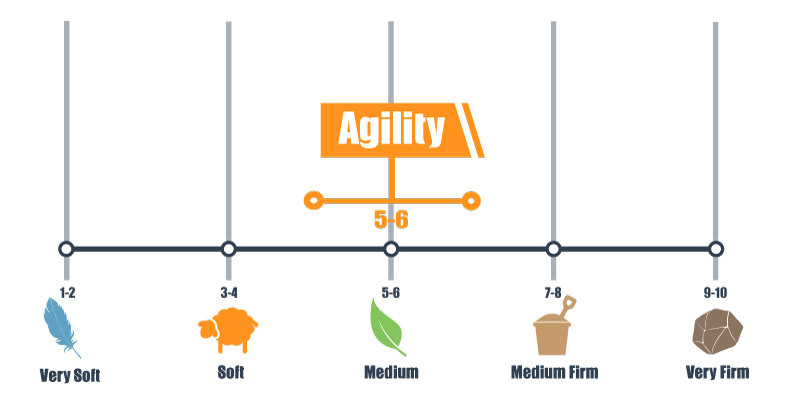 We rank the Agility Hybrid at a 5-6 on our Firmness scale that sees 1 as feather soft and 10 as rock hard. This makes this mattress a true Medium to Medium-Firm comfort level. People of most sleep preferences should find this comfort level suits their needs. You should notice a deep cradle with body contouring, but the latex should be buoyant, helping you stay on top of the mattress. This should promote airflow for a cooler sleep experience. Each latex zone should have a slightly different feel, with the zones near the hips and shoulders feeling Firmer, while the back, feet, and head should enjoy more flexible, Soft support. There should be noticeable bounce and a very quick response. This should help the latex to reshape quickly when pressure is released to reduce divots and impression spots as you move around. This should help combination sleepers to reposition easily despite the deeper cradle. Most back sleepers should appreciate the supportive body contouring that should fill the lumbar region to provide support and a neutral spine. Most side sleepers should find the zoned latex creates enough sinkage and pressure relief to reduce pushback in areas such as the hips and shoulders which require more sinkage to promote a neutral spine. The support in this area should feel Firmer and a little less flexible than the head or foot zones, but most should still find the comfort level Soft enough to suit their needs. Most stomach sleepers should find the solid support from the coils, combined with the Medium to Medium-Firm comfort level, prevents the hips from sinking too deeply. This should help promote a neutral spine for maximum comfort. Because of the universal comfort level and zoned support, people of all sleep preferences should find something to love in this mattress. There is no set weight limit for the mattress, but the company does recommend those who need something a little more heavy duty should consider the Therapedic’s Medicoil HD or TheraLuxe HD. Motion transfer should be minimal as most vibrations are trapped inside the dense memory foam. The micro-coils are also designed to reduce motion transfer by giving way and moving with vibrations in all directions. Co-sleepers and those who share their bed with pets and children should notice fewer sleep disruptions. There may be some noticeable compression when sitting on the edge of the mattress. This is normal for a bed-in-a-box product and is not necessarily a deal breaker for most shoppers. Edge support should be much more consistent and solid when lying on the edge, which should help buyers make the most of their sleep surface. Trial Period – Agility offers a 100-night sleep trial so you can become acquainted with your new bed before making your final decision. CertiPUR-US® Certified – The foams in this product are certified to have low VOC emissions and is free of heavy metals or harmful chemicals. OEKO-TEX Certified – The latex in this item is certified to the OEKO-TEX Standard 100, Class 1. This indicates the product is safe for adults along with infants and children from the ages of 0-3. Shoppers of all preferences should enjoy enhanced pressure relief, easy repositioning, and a cool sleep experience. Agility wants to provide you with a quality product and a perfect night’s sleep. To achieve this, the company set out to combine all the most popular benefits of both all-foam and innerspring beds. This mattress combines sinkage and body-contouring with bounce and easy repositioning. 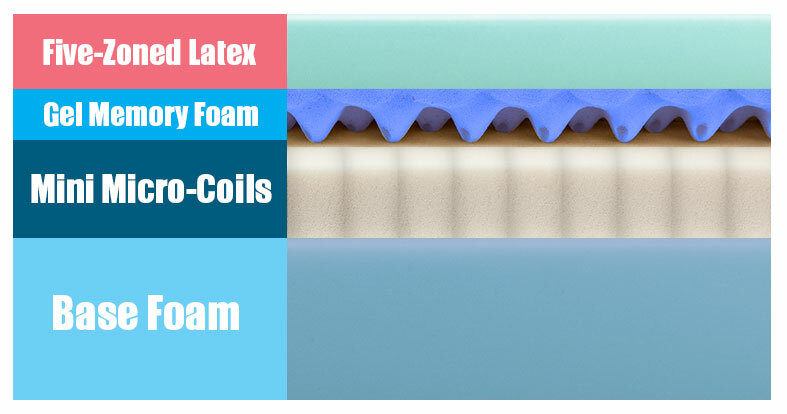 With 5 comfort zones in the upper layer of latex and a combined foam and coil feel, most shoppers should find the universal comfort of this Medium to Medium-Firm bed fits their needs. Therapedic believes not all mattresses are created equal. With quality materials and a large array of features, the Agility Hybrid should be a great fit for your sleep preferences.